NO, they most assuredly ARE NOT. They haven’t been since about 6 months after they launched back in August of 2016. They stopped selling extracts, and converted to concentrates. Please have your facts straight before you make sweeping declarations. The question asked was about Super Concentrates and I suggest you do some further study before you question my answers. Does it all make a difference as to what is in the flavour consintrates? It does. In most cases, not all tho, a super concentrate is much more potent and can/should be used at lower percentage in comparison to the regular flavor. To archive that, again not always but most, the base of the concentrate is something like alcohol or/and pg. Vg based is a good option for people sensitive to pg. Vg flavors in my own opinion, are weaker and take ages to steep, in comparison to alcohol or pg based flavorings. So looking at the name of concentrates is somewhat important and if not labeled correctly or in doubt, reading the data sheet would provide that information, unless it’s a non transparent company that likes to hide these things. We do have beginners guides explaining all that, as well as hundreds of information listed on other platforms, YouTube etc. It can be overwhelming at first, but reading up is pretty much what i would call mandatory, staying safe and not grabbing for examples oil based concentrates etc. Rf doesn’t fall under that tho. Wish they would ship kangaroos, always wanted one lol. And I don’t know why I even type this, but I still want one! When they are not. Extract is one of the ingredients. 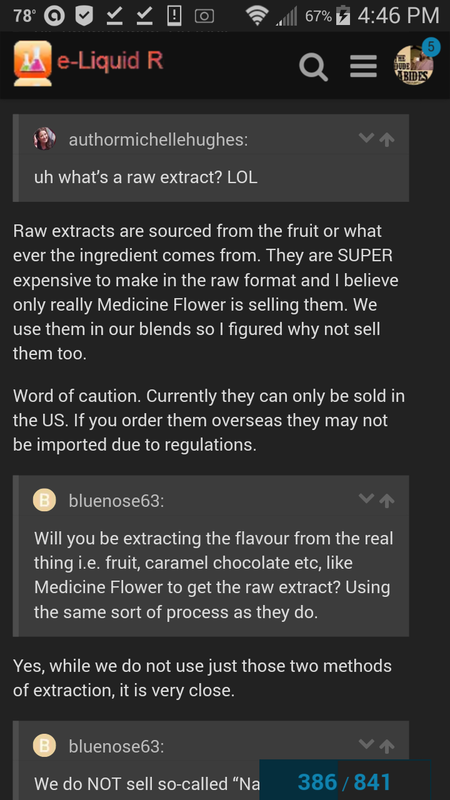 But pure extracts are a completely different product. 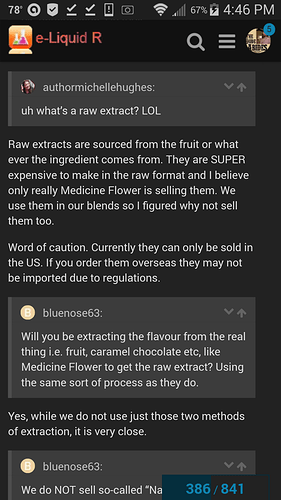 RF did sell what they called “Raw Extracts” at one time, but they were very short lived. But even then, Walt himself said the process was different than what MF (who makes REAL extracts) and others do. Even still, they were a very close approximation of a pure extract, and were overall a wonderful product. While some of the SC offerings no doubt contain extracts in their mixture of other ingredients, there is a HUGE difference between being an extract, and containing some extract. We have a bit of time still. Just working out how to make the transition. From what I was told. Walmart will go live Monday, Amazon will have them shortly after that. As of right now no traditional resellers have these instock. If you have no physical issues (PG allergies/sensitivities, etc) then no. As long as its taste makes you happy, and meets your needs in how you mix, it’s all good. It’s more about finding a flavor that meets your taste expectations at that point. If you do have certain issues (aversion to alcohol, PG issues, have to mix at a certain viscosity due to tank/wicking needs, etc) then yes. It can become important (to varying degrees, dependant on the individual’s situational requirements). 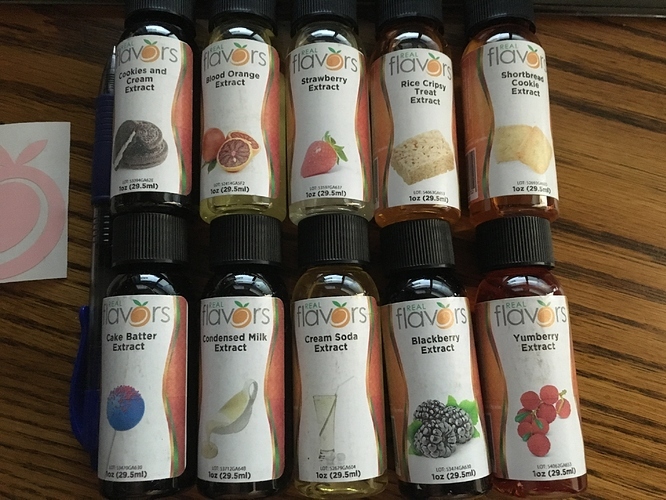 I wouldn’t get too caught up in the “side notes” here… But focus more on finding what suits your tastes, and learning what you need (percentage wise) to suit your vaping style. 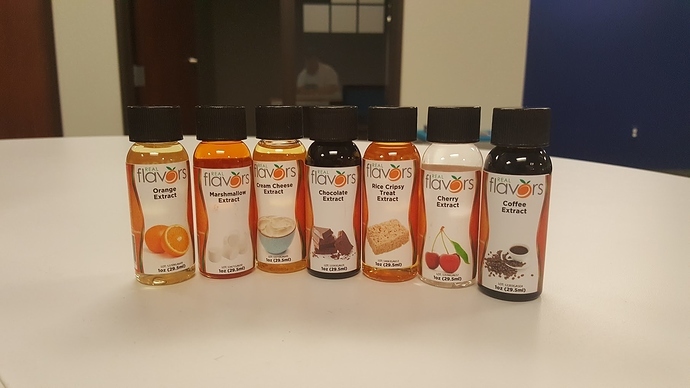 extracts are usually far truer to the flavor profile, because they’re literally that item (fruit etc) that has been reduced to an ultra concentrated form. But they are far more expensive because of the process, and raw materials. concentrates can be anything from pure chemical synthetic creations, to combinations of extracts and chemicals. But they are “approximations of” (or interpretations of) what someone’s understanding/expectation of a profile is (fruits, etc). As much as of our food is processed, they often contain chemical representations of actual flavors, so don’t let that scare you off. Most are the same level of safety (or higher) as what’s on/in the products on your grocery store shelves. The big thing you need to avoid is oils. Outside of that, it’s all subjective. I dont think there really is any dumb questions when beginning your DIY journey. There is plenty of information online that im sure would help you along the way. Ive learned a lot on this forum and i also did my own research. There is a lot more information online now, then when i started. Have fun and be patient, because the fun is in the journey.